A couple of these items have featured on my blog before - I love those flatforms, especially the silver for summer, but I wear heels 95% of the time and in chunky flats I have a feeling I'll look slightly clownish! Many people know about the holographic PLNDR bags but as far as I know they've now all sold out, so instead I found this Nasty Gal alternative (also available in purple). I can't wait to maybe order it next time I go to my Dad's in America, it's so pretty and would go with absolutely anything, the holographic trend is one that's easier to work through accessories and this bag is perfect for that! 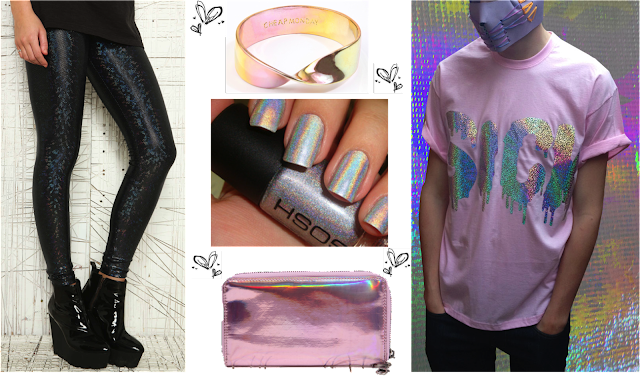 At the top of my wishlist right now has to be the GOSH holographic nail polish and this tee by Jade Clark - I love all of her designs but they're rather pricey and this one just happens to be on sale! I'm just worried about the fact that it's meant for men and the smallest size they do is a medium..on the other hand I guess drowning in a pink t-shirt of shiney rainbow loveliness isn't the worst way to go. 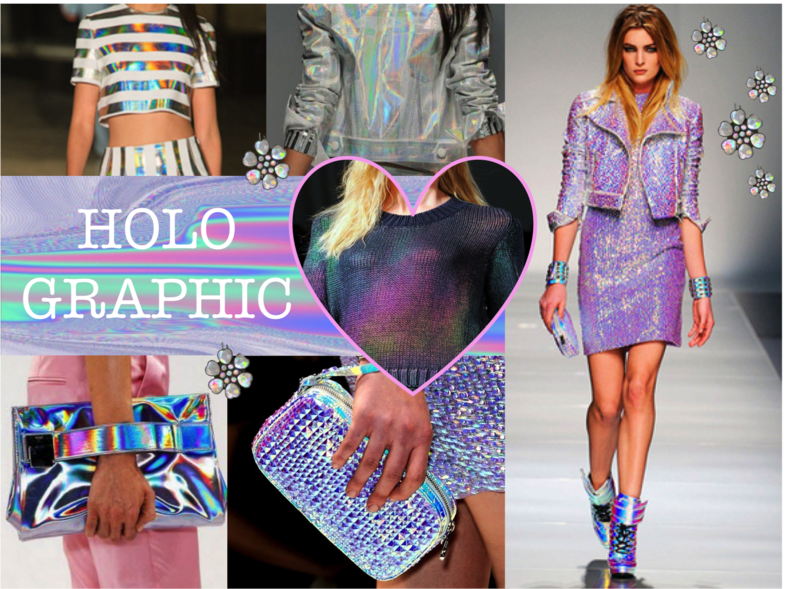 What do you think of the holographic trend? Adore this trend, its so perfect! Absolutely loving the holographic trend! I love the holographic flatforms! What a great trend, love the MG skirt! I've had my eye on the MissGuided metallic skirts for ages, think I might have to take the plunge and get myself one!